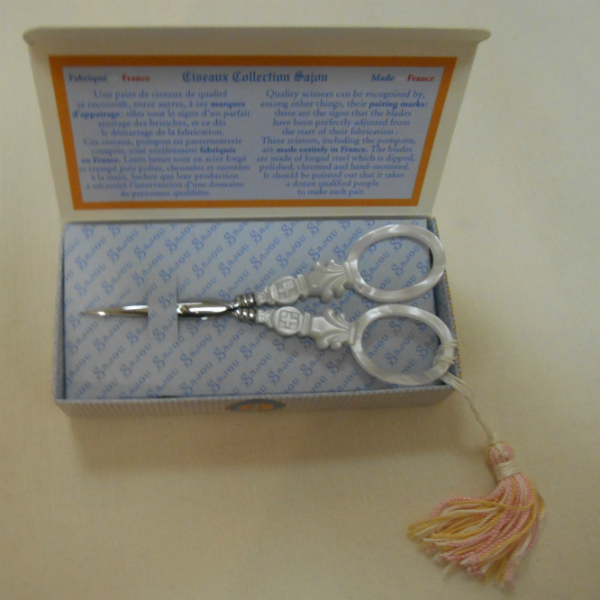 Beautiful mother of pearl handled scissors from Ciseaux Collection Sajou. "Quality scissors can be recognized by their pairing marks: these are the signs that the blades have been perfectly adjusted from the start of their fabrication. These scissors, including the tassel, are made entirely in France. The blades are made of forged steel which is dipped, polished, chromed and hand-mounted. It takes a dozen qualified people to make each pair."